Wholesale Economy Lunch -Picnic Coolers, Personalized with Custom Imprint or Blank. Promotional. Red, Pink, Royal Blue, Purple, Forest Green or Black Bargain Prices for USA, Canada. On Sale Today! Fast Delivery. 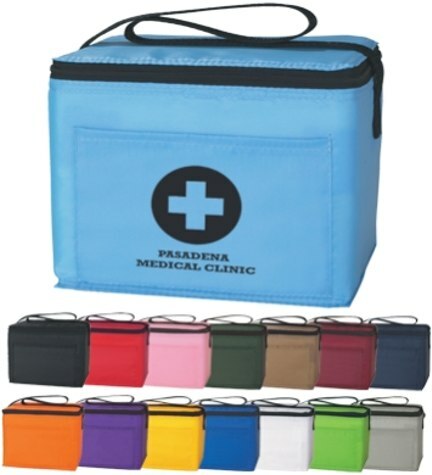 Bulk discount lunch, picnic and golf coolers in many colors. This sturdy, well insulated 6 pack nylon cooler bag features one round-the-top zippered main compartment and one large open front pocket. Free artwork design. We will send you a proof for your approval before production. Budget Prices in USA and Canada for wholesale personalized lunch coolers. American clients pay no taxes. We also supply wholesale blank coolers. (not custom imprinted).